This golden-yellow fruit is widely known as an emblem of happiness, love and fruitfulness, and features strongly in the history and mythology of ancient Greece and Rome – it was for a golden quince Atalanta paused in her race against her suitor, Hippomenes (Melanon), and the “golden apple” Paris awarded Aphrodite is thought to have been a quince. Although having a strange “pear on steroid” appearance, this fragrant native of southwest Asia, notably Iran and Turkey, has the ability to fill an entire room with strong, sweet perfume if left at room temperature for several days. The small, irregularly-shaped deciduous tree – they take on an unusual gnarled form as they mature – reaches a height of 5-8m, and a width of 4-6m, and is long-lived. The large leaves, which turn yellow in autumn, are deep green, and densely covered underneath in fine, white hairs. White or pink showy flowers appear at the end of leafy shoots in spring, followed by the bright yellow fruit, which ripens in March and April. Although the fruit has very hard skin, which doesn’t soften even when ripe, the quince is hard to beat for size and colour in the autumn – they cling to trees for months on end. Quinces are easy to grow, thriving under most conditions, and happy in a wide range of soils, though they prefer a fertile soil in full sun. They are more tolerant of wet soil than apples, and although drought-tolerant, will grow and fruit better with regular moisture whilst getting established. Trees will need to be protected from pear slug. This pest is small, slimy and black and in a very short space of time can easily defoliate an entire tree. A spraying of Target will help remove this pest, but if you prefer an organic approach, a spray of derris or pyrethrum could be used instead (derris is toxic to earthworms so care is needed when applying it). You’ll want a warm autumn to ripen fruit, but quince are quite frost hardy, and can tolerate low temperatures. Trees are pollinated by bees, and are self-fertile, though by planting more than one tree you will get more fruit. Quinces require long, hard stewing to transform their hard, bitter-sweet flesh into ruby-red delectability, but they are a good source of pectin and vitamin C, and are great in marmalades, jams and jellies. 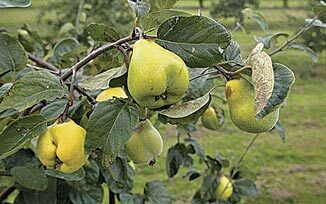 “Giant of Gascony” is a very large fruiting selection with good aroma and a distinctive spicy flavour, and the early-ripening, very hardy “Van Deman” has large, yellow-orange, oblong/pear shaped fruit with a good, spicy flavour – the flesh is pale yellow. My favourite is the popular “Smyrna,” a handsome, hardy tree with lovely pink blossoms and unusually large, elegant leaves. Originally from Turkey, the fruit (which keeps very well), is large to very large, furrowed, oblong/pear-shaped, golden-yellow and extremely aromatic. The flesh is a light yellow, mild, tender and flavoursome. There’s also a Kiwi variety sold as “Taihape,” which has been propagated from the lovely old tree at The Brown Sugar Café in the town. You can get “Taihape” by mail order from Wairere Nursery or The Edible Garden. 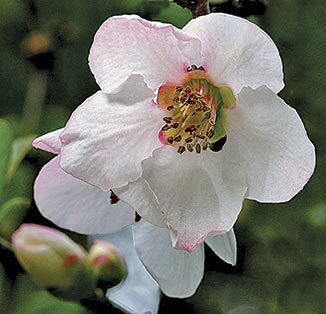 Quince trees are best planted during early winter/winter, and are available in garden centres as bare-rooted trees in late June or early July, or as container-grown or bagged trees in early spring. Trees may need staking for a few years to support the top-heavy growth.